This very special prayer was written by a good friend and a great American. It was first delivered at the Tailhook Convention, that annual gathering of naval aviators qualified to land their aircraft on the pitching deck of an aircraft carrier at sea. Tailhook is well-known as a rowdy party for a rowdy group, but when Bug Roach rose and delivered this prayer, you could have heard a pin drop in a banquet room filled with naval aviators and their guests. "Bug" Roach was larger-than-life, a true legend in Naval Aviation. He was an enigma, a pilot who, in a Naval Career that spanned more than 25 years, never had a non-flying tour. He didn't care that it wasn't the smartest "career move." Bug wanted to fly, and that was all that mattered. The rank insignia on the shoulder of his flight suit was irrelevant. He was loved and respected by many a pilot he "talked down," and there were many. You see, in addition to being a quintessential fighter pilot, Bug was an LSO, a landing signal officer. He was the guy who stood on the deck of the aircraft carrier and guided the pilots aboard. On those pitch-black nights, with no moon (and therefore no horizon), many a nervous pilot was relieved to hear the familiar voice say, "I gotcha." One of the most famous "Bug" stories tells how one dark, black night, following a total engineering casualty on the ship (meaning there was no power whatsoever on the aircraft carrier), he used a hand-held radio to talk down six aircraft, with the flight deck illuminated by the headlights of flight deck tractors! If you were airborne on a dark night, or returning to the ship with a damaged aircraft, or with vertigo so bad you didn't know which way was up, there was no voice you'd rather hear on your radio. and the first ever S-3 with an unlocked wing. 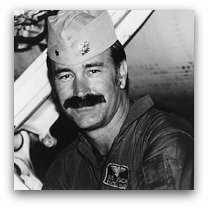 Stories about Bug can be heard in any gathering of those who were Naval Aviators between 1966 and 1991, and even later. He was so well-known for his expertise as an LSO that when the Navy League decided to sponsor an annual award for the "LSO of the Year," it was named the "CDR John 'Bug' Roach Paddles Award". The first award was presented in 1990, while Bug was still on active duty. One gray October day in 1991, Bug was flying an A-4E out of NAS Miramar, "Fightertown USA" and Home of TopGun, with the Bandits of VF-126. His engine flamed out, and when re-light attempts failed, he was forced to eject from the airplane over the Pacific off the coast of San Diego. His wingman never saw a 'chute. It was no coincidence that it happened to be a Wednesday. In the late 1980's and early 1990's, the NAS Miramar Officers' Club was legendary as the place to be on Wednesday night. There were rumors about the ladies being bussed in, and it was so crowded it was often difficult to make your way through the bar. There was never a dull Wednesday night at the Miramar O Club in those days. This Wednesday night was a bit different. Bug had left instructions with Bonnie, the bar manager at the O Club, that drinks were to be "on him" the day he "bought the farm" (his words). As the word made its way around the base that afternoon, pilots and others made their way to the Club in disbelief, to share their grief and raise a glass (or mug) to pay their respects to Bug. The tradition carries on to this day, albeit in a different venue. Every year, at the annual Tailhook convention, a gathering of those Naval Aviators qualified to land on aircraft carriers, the Friday night happy hour is known as the "Bug Roach Memorial Mixer," and glasses are raised in many a toast to Bug and other departed friends. Bug Roach was one of a kind, and a true friend. We miss you Bug, and we'll keep your legend alive. We know you're still out there somewhere, Bug, helping those Tailhookers make it back aboard, and we're grateful. Keep up the good work. More tributes to Bug Roach. Return to top of We Are the Nation.